If getting out of Sevierville and into the Great Smoky Mountains is on your list of things to do, there’s no better ride the 2018 Toyota Tacoma. But you don’t have to take our word for it, check out what the critics had to say, then drop by and make up your own mind about this impressive mid-sized truck. Potent Engines – Drivers can choose the 4-cylinder engine for 20 mpg/city and 23 mpg/highway or the V6 engine that delivers 278 hp and 265 lb-ft of torque. 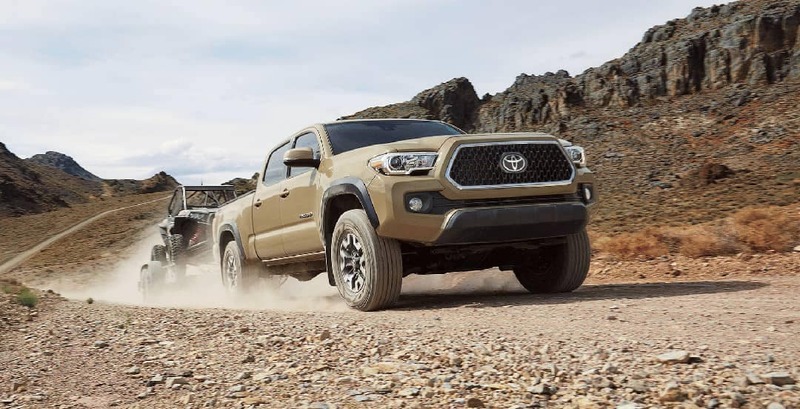 Off-Road Control – Features like Multi-Terrain Select and Crawl Control make the TRD off-road models some the most sought after in the industry. Advanced Infotainment – Entune with App Suite allows drivers to connect their compatible smartphones and take advantage of maps, music, hands-free calling, and much more. Standard Safety – Every Tacoma is equipped with the Toyota Safety SenseTM (TSS) and Star Safety systems that include smart stop technology, pre-collision with pedestrian detection, and more. Get behind the wheel of Toyota’s midsize dynamo and see for yourself why the 2018 Toyota Tacoma reviews are glowing. Contact Rusty Wallace Toyota or visit our showroom in in Morristown, just a quick drive from Knoxville.